Many businesses feel they should be doing SEM, but sometimes have a hard time measuring conversions or even defining what a conversion is for their online properties, particularly if they are in a highly-regulated industry that has significant privacy or security concerns. The good news is that PPC provides value beyond conversions. Many people believe that they should only care about transaction and conversion performance in their PPC ad campaigns – and make no mistake, conversions are the most important goal for PPC – profit and ROI are #1. And Google has purposefully built AdWords to reward conversions. But your ads can achieve three valuable goals, even if visitors don’t click on your ads – control the message, get and maintain top position, and defend your brand equity advantage. In ads, you can show search engine users content you want them to see. Unlike organic search results, you completely control the text and links visitors see in your PPC ads. So, even if a visitor doesn’t click, they still see the content you want them to see – and it’s free since you only pay for clicks! More brand exposure can result in an increase in branded searches and an increase in click through rates. This is a search engine “real estate” play. Your search engine ads will push organic results down the page. When your ads are in the top area of a search results page, they fill up the space at the top of the page which means organic results appear further down the page, which also means visitors are less likely to see (and possibly click on) organic links. This is useful if you have a competitor that is achieving top organic position for desirable keywords – your PPC ads will push the competition’s organic results down the page and hopefully out of view! And, if you are getting good organic results for your pages, you push your competitor’s results even further down the page. Example: In a recent search, Virgin Mobile does not come up in the first page of organic results. 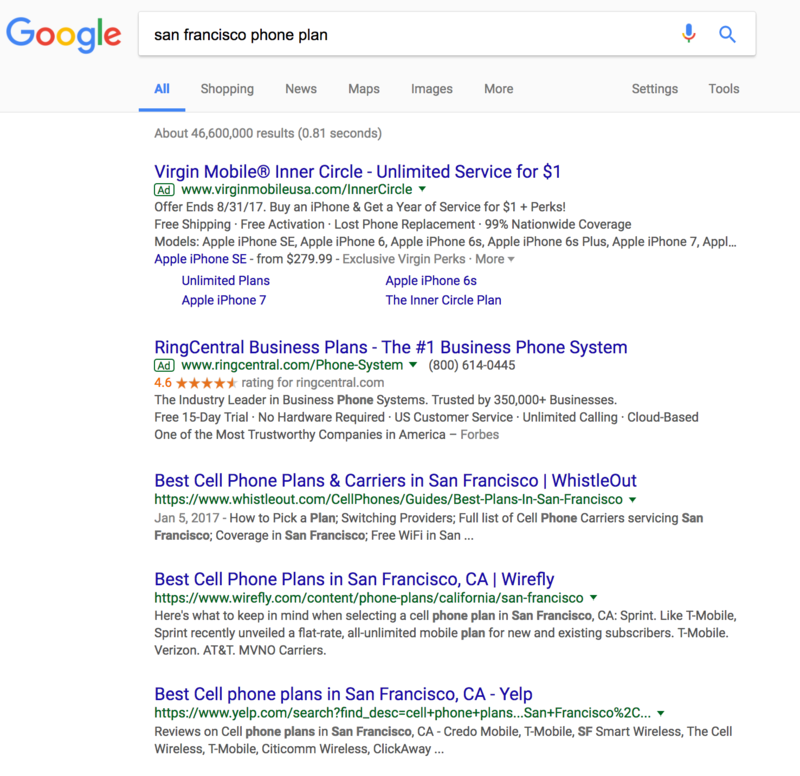 However, by bidding a keyword phrase like ‘San Francisco Phone Plan’ they were able to snag a position on the first page, show up at the top of the results and push the competition down the page by grabbing a lot of space at the top of the page. We call this “defensive SEM.” If this is the only PPC you can do (or afford), this is the one you must do now – simply to fight off the competition and maintain your brand equity advantage. This is most effective for trademarked brand keywords (keywords that contain your company name or product names). Your competition can (and if they’re smart, will) buy your brand’s keywords. Your competitors can’t show your brand’s trademarked keywords in their ads, but they can show them on their landing pages. That’s the bad news. The good news is that you’ll pay less for the same keywords than they will because Google will probably reward you with cheaper clicks. In our experience, competitors will often pay four times (4x) what the brand owner pays for the same keywords! Here’s how it works, at least from Google’s perspective. – When visitors click on your ad, they will likely be more satisfied with the content they receive from your pages, compared to your competitor’s’ pages, because your landing pages will contain your brand keywords, be fully branded, and the content will be all about your brand. In other words, the results of the search will more closely match their search. This improves your ad quality score and in turn affects your CPC. Basically, you get clicks for your branded keywords cheaper than your competition because Google wants searchers to be satisfied with their search results. You have a natural advantage over the competition, but only if you’re buying your brand keywords. No matter what your market, chances are your customers are online and using Google. And chances are your competition is either using SEM tactics or considering it. If your competition is sophisticated, they will try to confuse the market or attempt to mitigate their inferior position in some way. SEM/PPC is quick, effective and you can easily control the budget. If you don’t have a lot of experience with PPC, or aren’t sure whether it’s right for your brand, you should consider the “defensive SEM” campaign we outlined above. Work with an experienced and reputable PPC consultant or agency and enjoy the results! Invaluable assistance from Leslie Yuen.